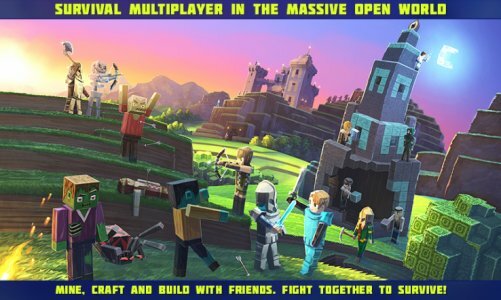 Planet of Cubes is Real Time Multiplayer block building game with thousands of players online in the MASSIVE open world. The game gives not just space for the game, but the opportunity to build this space in a huge game world, create a digital planet and find new friends from all over the world. At the moment, the game has two modes for playing online – Survival and Creative. In Survival mode player has options to craft tools, armors, weapons, food, and other blocks – everything to progress. Farm, or hunt, add users to friends and play together, or fight -choice is up to the player. Creative mode gives the possibility to rent chunks and create own architectural masterpieces. All blocks are available in the inventory, and players can not attack.